We believe the second most important aspect of your wedding is the first meal you will enjoy as husband and wife, and such a special occasion demands an exceptional menu. Our carefully selected recommended caterers offer mouth-watering menus to suit all tastes and budgets. From barbecues and hog roasts to fine dining three course meals and chocolate fountains! At Cooplet & Co. we care about the produce as much as the customer. A family owned business, we are the Wedding and Event arm of The Hayloft Restaurant, Menheniot, Liskeard in Sunny South East Cornwall. Owned by Linsay and Matt Burns, who took over the Hayloft Restaurant in 2016. Linsay looks after the organisation and the communications and Matt looks after everything operational and food; a dream team to organise your special day or special event catering. We take what we do seriously, with over 30 years combined experience, Matt is an ex Michelin Star Trained Chef- having held 3 rosettes, multiple gold TASTE awards and was Caterer & Hotel Keeper Award winner in 2010, we deliver the top end of food and service and price points that suit all! Lucy and Mike of The Good Food Catering Co. believe passionately in what they do and have enjoyed a leading reputation as wedding caterers over the past ten years. They realise that every wedding is unique and so their service is personal and flexible, allowing them to play close attention to your individual needs and provide you with the perfect catering solution. Whether you would like delectable canapés or an impressive wedding breakfast, a mouth-watering buffet or a scrumptious afternoon tea with flair and originality they will create delicious, imaginative food that you and your guests will love to eat and never forget. None of menus are set in stone and we actively encourage couples to have their input into their menu design so that each client has exactly the menu they desire. Anything is possible which we have proven with Japanese, Indian, north west Pacific inspired sharing platters, traditional British, Cornish menus with a twist, barbecue sharing platters to name but a few. 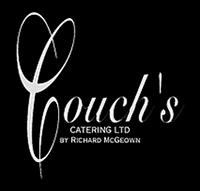 Richard McGeown of Couch’s Great House Restaurant offers a totally bespoke menu service, aiming to make the planning of your wedding at Trenderway Farm as easy and enjoyable as possible. Having previously trained under Gordon Ramsay, Raymond Blanc and Marco Pierre White, in addition to a decade of Restaurant experience, Couch’s boasts an impressive portfolio of over 400 weddings and events. The finer detail of your wedding is of paramount importance to Couch’s. Menus are individually tailored to suit, season, taste and budget, with complimentary tastings and online planning support. We invite you to browse Couch’s website to glean ideas and begin to create a wedding menu that will be memorable for years to come.